One of the more tedious entries on my list of places to record is public houses. So, reluctantly I made my way into the Red Lion in St. Osyth to record the jovial clientele I could hear from outside. A few of the locals had been in there since the early afternoon and were on their fifth pint. It was a friendly and happy pub, with good ale and, as it turned out, one of the best steak and kidney pies in all of Tendring. 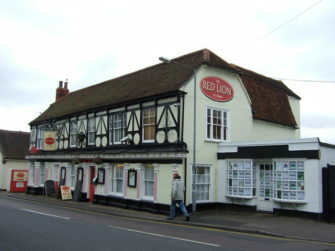 Image of the Red Lion pub by JThomas used under Creative Commons (Attribution-ShareAlike) licence. Aye, it’s a hard life. I appreciate your dedication to the project, frequenting all these pubs.